If you lack the square footage for elaborate cat furniture, there are plenty of ways to help your cat branch out (and up), and make you feel like he’s got more room than you. This shelf was made from recycled materials: an unwanted entertainment center about to be abandoned at a dumpster by a neighbor. The Whisker Shop is a participant in the Amazon Services LLC Associates Program, and some links in this post are affiliate links. This means that there will be no additional cost to you if you shop at Amazon.com using these links, but we will receive a small percentage of those purchases as a commission. The opinions in this post belong to The Whisker Shop, and we only recommend products we would use or have used ourselves. Tip #1: Think vertically! This is really the best way to maximize a cat’s space. Adding shelves, or rearranging stuff on existing shelves to make room for cats, is like adding a cat magnet for most cats. Keep in mind the size and age of your cats: smaller or older cats may need additional shelves or a chair moved so they can get on and off the shelf safely. Make sure the shelves can hold your cats’ weight and the force of their jump, to avoid unnecessary injuries and home repairs. You can have us design custom cat shelves, or buy something premade like these Better Homes and Gardens 4-Cube Organizer and Bookcase. If you buy something taller than it is wide, be sure to also get some kind of wall-mounted fastener like these Anti-Tip Furniture Wall Straps used for childproofing and earthquake-proofing. 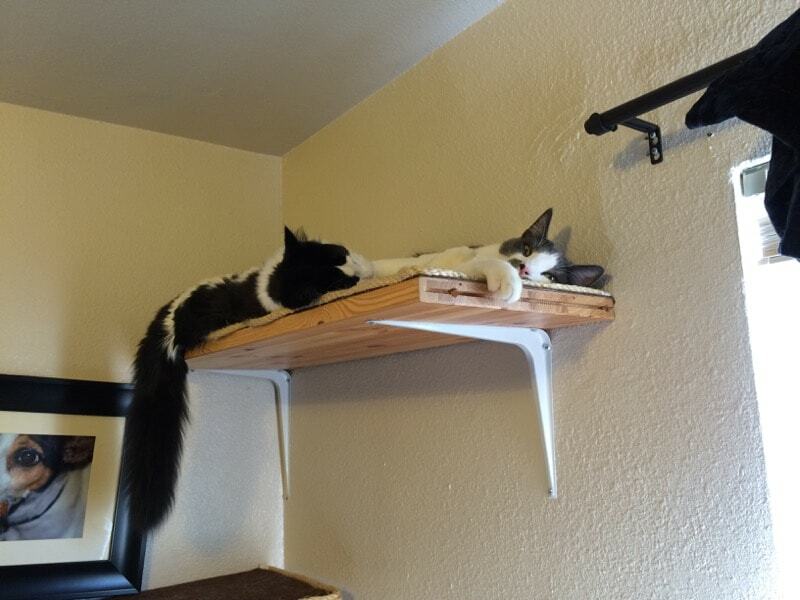 You may also want to try this door-mounted set of cat shelves, although you may need to add additional hardware (screws or nails) for more stability. Tip #2: Think multi-purpose! Dedicated cat furniture is beautiful and helps your cat feel like she really owns her space. 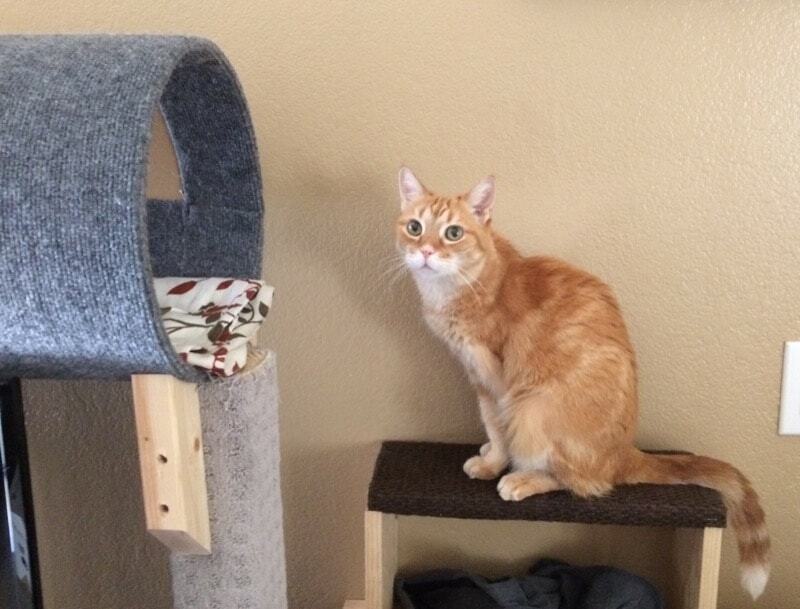 But sometimes you just don’t have the floor space to dedicate to something like our beautiful round retro cat condo. Adding something like a Clamp-on Desk Shelf to an existing desk or table will let you keep working while your cat supervises from above. If you already have a desk with a shelf, consider clearing off some space and adding an inbox for your cat. Sometimes an empty box lid is all that’s needed to entice a cat to use a new space, or you can try something much cozier, like a MidWest Deluxe Bolster Pet Bed. Tip #3: Maximize space! If you’ve got extra leg room under your desk, or under a table where you spend a lot of time working, your cat may want to join you (and get in your way). Try tucking a cozy place to call their own near your feet (but not so near where you might kick them! ), like the Zen Den Cat Hideout. We like the Zen Den because the top comes off for easy access in case of emergencies, and it folds flat for travel or storage. It’s also great for cats who prefer to be closer to the ground. Yeah, we know. 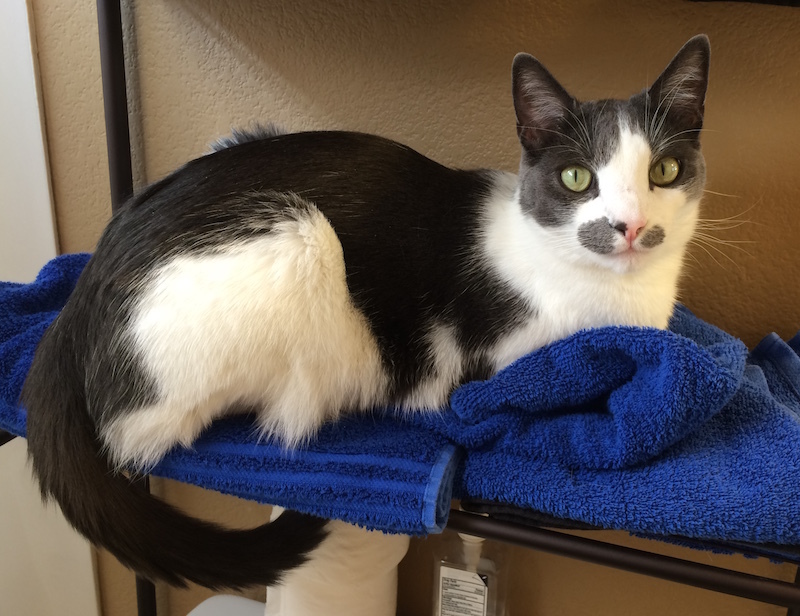 No one wants to dry their hands on a towel a cat’s been sleeping on. To be honest, we think Kepler knows, too. When you discover an accident, the first step is to pick up or blot the solids or liquids with a paper towel or washable cloth. We use heavy paper towels, but a dedicated handful of microfiber towels are a greener and much-more-absorbent option, plus you never have to worry about running out when you need one or leaving behind bits of paper while you’re scrubbing. If the accident happened on carpet or a rug, generously spray the stain with some kind of enzymatic cleaner. We were big fans of Nature’s Miracle for years, but they recently changed their formulation to include a very strong floral perfume that lingers for days, so we only recommend using this if you’re in a large, well-ventilated space away from sensitive notes (human or feline!). We are currently loving So Phresh Cat Stain and Odor Remover, which has a mild floral scent that dissipates within a few hours. We let the cleaner sit for a few minutes, then wipe it up with another towel. If it’s a darker stain, we spray it again and leave it. We notice that most stains will disappear within a day, although sometimes an extra spray treatment is required. Enzymatic cleaners work well on tile or hardwood floors too. While soap and water will usually do the trick, the enzymes in these cleaners will help destroy pheromones and other scents that might inspire a cat to repeat the performance in the same location at a later date. These cleaners can also be added to washing machines for bedding and towels to help eliminate stains and odors. You may still need to spot-treat with something like Shout Stain Remover, however. Remember to do a spot test first! If you are unsure if the fabric you are treating can handle the cleaning products you’re about to use, always do a spot test on an inconspicuous area to make sure the cleaner won’t harm the color or the fibers. Enzymatic cleaners are generally safe in that regard, but occasionally some organic dyes or fiber-dye combinations will be unusually susceptible to problems. And if you just can’t handle all the extra elbow grease (we would not blame you! ), you can get this great little Bissell SpotBot Pet handsfree Spot and Stain Cleaner, and let a robot do the work for you! Don’t let their size fool you. They tested the limits of our cleaning abilities when they were young. When you’re an elderly tripod kitty, you’re allowed to have accidents. They’re just the price humans pay for living with such greatness. Because we are paranoid about “missing a spot” in a multi-cat household, we always have a black light flashlight handy. Black lights (which are actually ultraviolet lights, but get their name because the human eye cannot see the UV spectrum) will cause biological materials to fluoresce or glow. A pet stain will glow in the same shape of the average urine or vomit accident, or you might see a speckled spray pattern behind a litter box or other places where a cat might be trying to mark his territory. Other non-biological materials will glow under a black light, like detergents, so don’t worry if you see little white flecks on your shirt where you shine a black light. Safety tip!! Always be careful when using a black light. Do not shine the light in human or animal eyes, and do not use the light more than necessary to get the job done. Ideally you’ll use UV blocking safety glasses like in the black light kit linked above, and many prescription eyeglasses will block UV light, but not necessarily enough to prevent a mild headache from a very strong flashlight. Keep your flashlight in a drawer or a case so that if it’s accidentally left on, it can’t hurt any children or animals who knock it over. Read all about black light and other cool things that glow under black light. How to “cattify” your living space, continued. As a follow up to our recent post about making your living space more cat-friendly, here are more cattification suggestions! Kepler was suave from a young age. 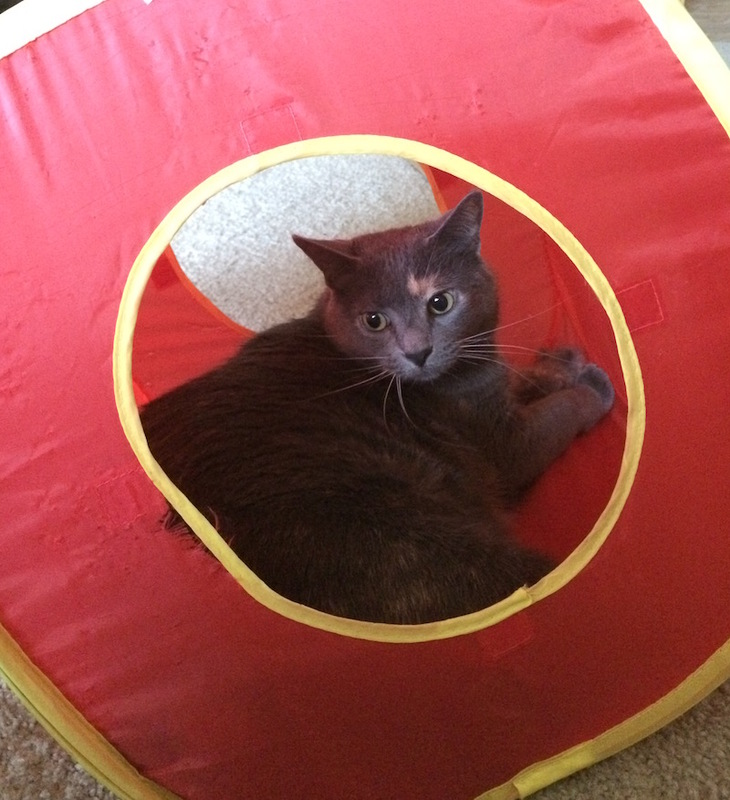 Pop-up cubes or tents like this Kitty City Pop-up Cat Cube are one of our cats’ favorites. They can “hunt” toys from inside the cube, dive into it, and roll around all over the place. They’re fairly sturdy, although after a year of use, they’re definitely full of claw marks and frayed around the openings. They can be folded flat for storage when not in use, or when traveling so they’ve got a cozy hidey-hole at your destination. We have used different brands over the years, and they all seem to wear out in the same way: claws, frayed seams, and wearing out the fabric over the wire frame. We inspect ours regularly, and as soon as the metal starts to show through the cube’s edges, we replace it with a new one for safety reasons. Miss Kitty feels secure inside her cube, and will often only play with toys if she can do so from this spot. 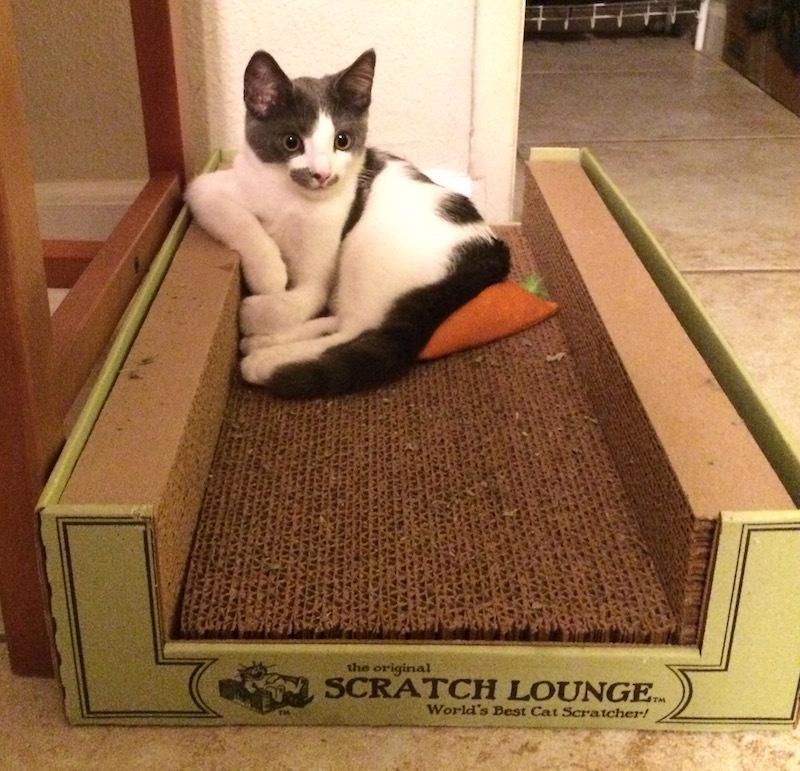 The Scratch Lounge has been the best of both worlds for Kepler: he can lounge in it like a cardboard box, and he can scratch the heck out of it when the urge strikes. Cardboard scratchers are nice option because they’re reversible so you’ll get twice the life out of them (just flip over when one side is sufficiently shredded), they’re lightweight, and they’re completely recyclable. 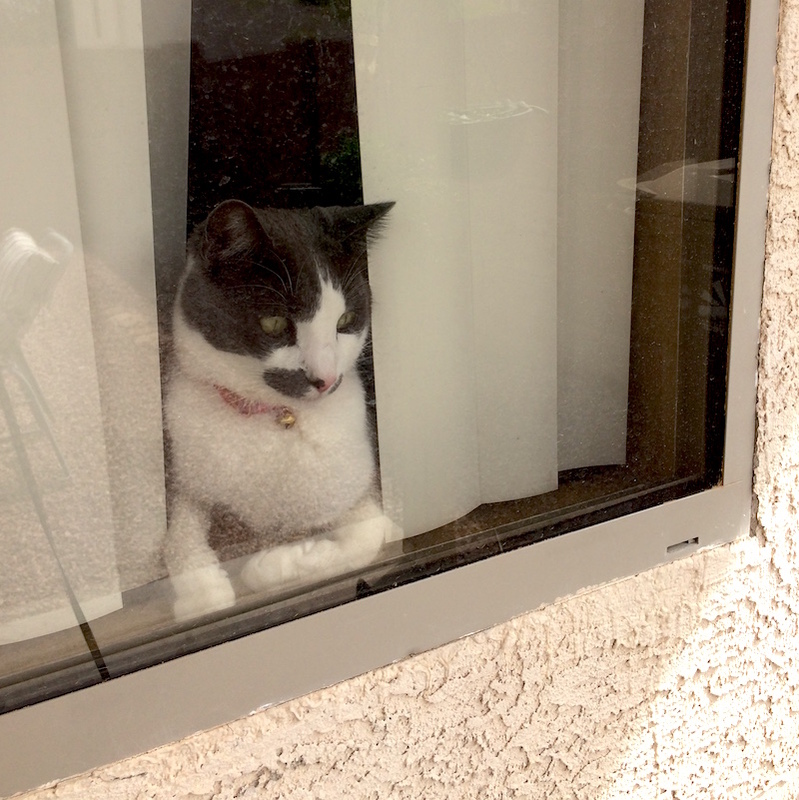 Pet screen: If you’re lucky enough to live somewhere where you can enjoy opening your windows on a nice day, your cats might love to hang out, and on, your window screens. We have replaced our screens with PetScreen many times, which is tear- and puncture-resistant. Not only does it keep your window screens looking nice, but it keeps the bugs out! If you’ve never replaced a screen before, it’s actually easier than we expected (but still involves a little elbow grease), and you might want to just grab a whole pet screen installation kit that has everything you need for a single window. Window treatments: Windows are like magnets for cats. Letting your cats watch “Kitty TV” is cheap entertainment and lets them view the outside world from the safety of their home. But cats can be pretty rough on blinds and curtains. Horizontal blinds don’t last long against window-loving kitties, and fabric curtains require regular lint-rolling or laundering, but vertical blinds are more forgiving when it comes to cats. They’re fairly inexpensive (about $40), and the slats can be replaced individually and affordably, if one should break off (and you can’t or don’t want to repair it with tape). They come in a variety of sizes (or you can cut them to fit), with subtle patterns and embellishments to match your home. Kepler doesn’t care what kind of blinds we put on the windows, because nothing will hold him back. According to Cornell University College of Veterinary Medicine, cats become senior citizens between the ages of 7 and 12; it’s different for every cat, and some cats age more quickly or differently than others. 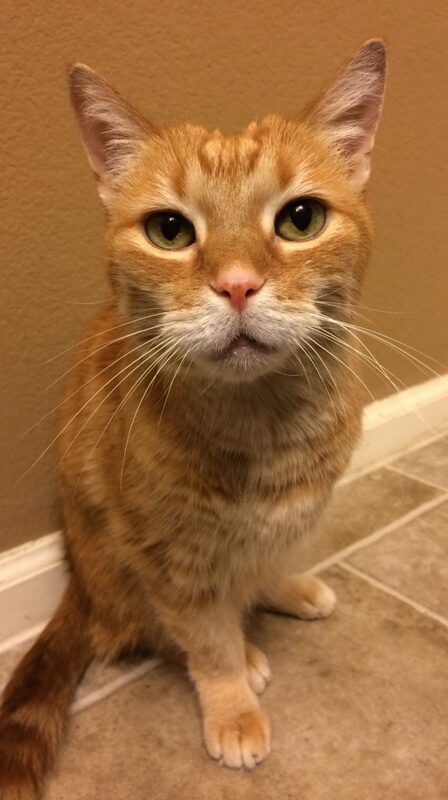 As our beloved Ginger aged, we learned a great deal about caring for senior cats, and some of her experiences may help you with your senior kitties. Getting older for all of us usually means it’s harder to stoop down like we did when we were younger. This is especially true for cats at meal time. A raised food bowl like this one will make meals more comfortable and encourage seniors to maintain their weight. When the temperature starts to drop outside, these Sunbeam electric throw blankets become the most popular spots in the house. We have several, mostly because we can’t bear to move a cat when we want to use one for ourselves! 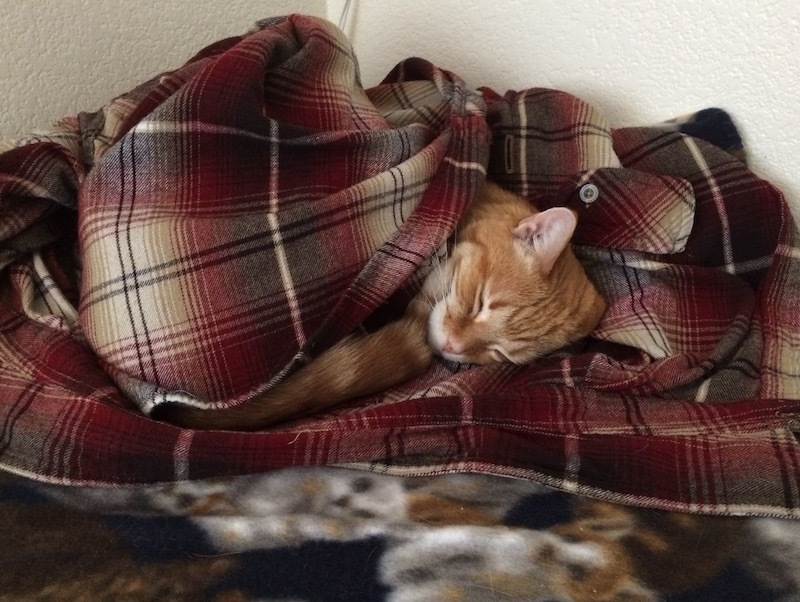 Keep it on the lowest setting, and always check in on your cats while the blanket is on, to keep them safe from overheating or any problems with the blanket. It doesn’t take much warmth to attract a cat! These will shut off after 3 hours, too, adding another layer of safety. 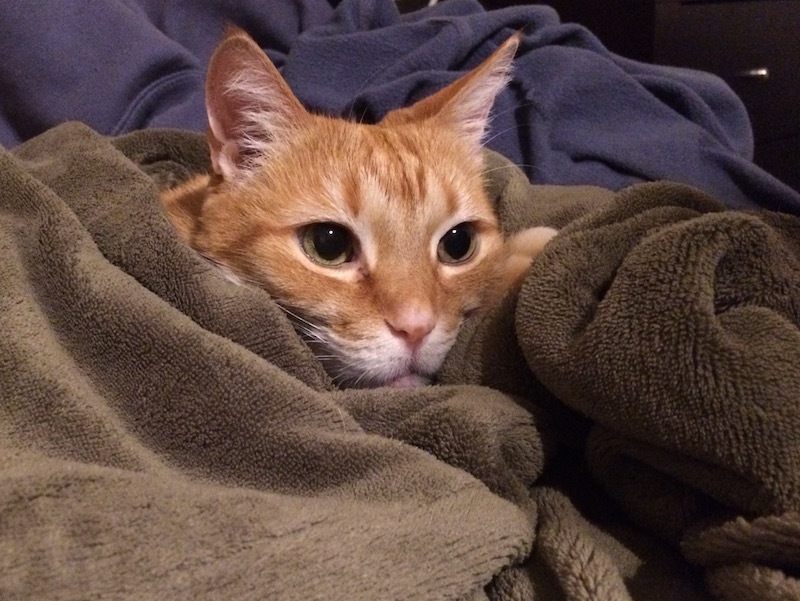 We don’t recommend using electric heating pads (like those used for injuries and arthritic humans) because we find they’re much warmer than the lowest blanket setting, and we have always worried about overheating our cats (or worse). 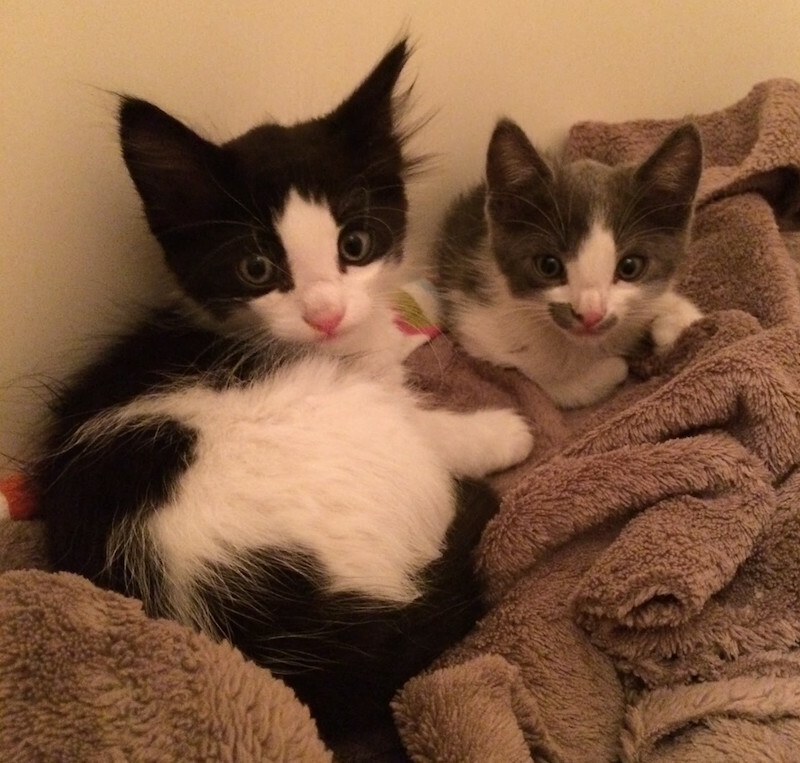 Try to shorten the distances between their favorite napping spots and their litter box and food dish. Pain from arthritis might slow them down, so they don’t reach the litter box in time, or they can’t make the trek across the house. This might mean accidents outside the box, or they may seek out less desirable places to relieve themselves, such as behind a couch. Cats like to be neat and tidy– if your older kitty starts doing this, they’re probably just as unhappy about it as you are! If there isn’t a convenient place for a litterbox, consider purchasing a litter box enclosure that will blend in with your decor and replace an end table or shelf. Or, if you’re in Arizona, you could have The Whisker Shop design something unique (drop us an email)! Consider adding shelves and steps to help them get to their favorite spots. 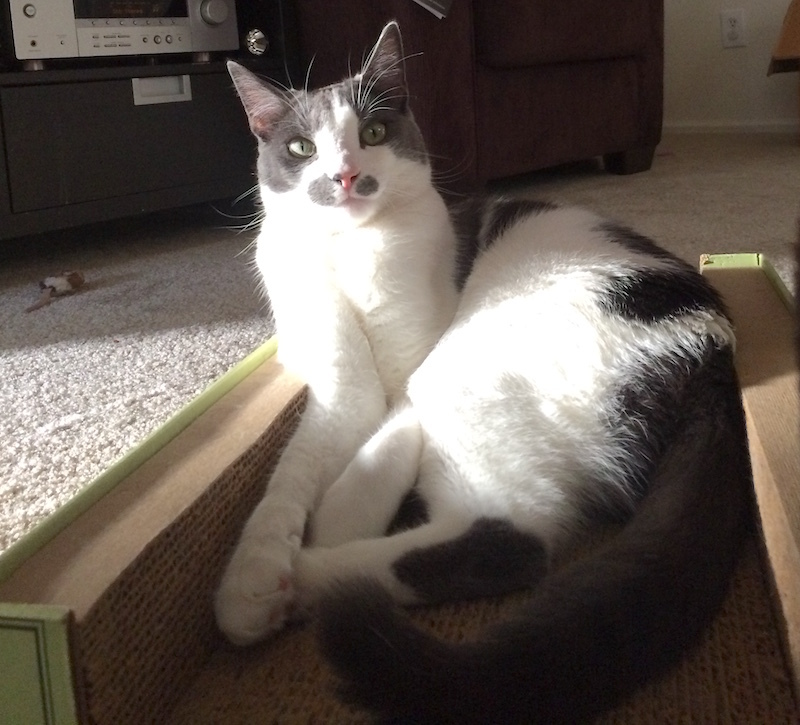 We would love to design custom cat shelves for your feline family members! The Whisker Shop is a participant in the Amazon Services LLC Associates Program, and some links in this post are affiliate links. This means that there will be no additional cost to you if you shop at Amazon.com using these links, but we will receive a small percentage of those purchases as a commission. The opinions in this post belong to The Whisker Shop, and we only recommend products we have tried ourselves, unless stated otherwise. The Neko Flies Kattipede is a favorite around here. It’s a “centipede” with a segmented body that looks pretty realistic crawling around the floor. These toys are incredibly durable, and we haven’t had anyone break one yet. The string attaching the bug to the stick is especially durable, although if you’ve got a cat who likes to chew, it won’t stand a chance. Just tie the two pieces back together and it’ll be fine. Incidentally, one or our furry friends likes the Kattipede well enough, but goes absolutely wild for the Kararantula. The Cat Catcher is another favorite around here, but The Whisker Shop recommends this with a caveat: with all stick toys, but especially this toy, do not let your cats play with this unattended. The mouse is bristly, like a bottle brush, and it will fall apart easily after a few minutes of gnawing. But cats love this one so much that it’s worth making sure to store it out of their reach when it’s not out for a play session. The Cat Dancer is an almost humorously simple toy: sturdy paper rolls on a thick wire, which flails around randomly like a bug. The drawback is that there isn’t a handle, so if you have arthritic hands or trouble with grip strength, this toy might not work for you. We have had success taping about 6 inches of the end of the wire to an old toy stick or wooden dowel to compensate for this. Yeowww Catnip Toys, like the catnip banana, is filled with super-potent catnip, and is large enough for cats to rabbit kick with their rear legs. Petstages Toss and Bat Toys are sturdy creatures, with well-sewn body parts, that cats love to chew, toss, and chase. We’ve had these last for years without falling apart. Some of them will contain rattles, too, which can be exciting for cats who love to make noise. 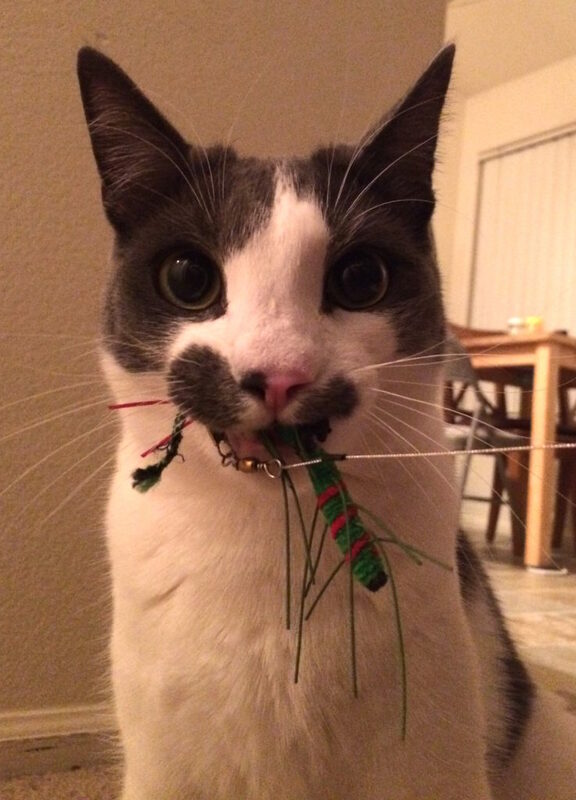 We would love to hear about your favorite cat toys! 1. to make more catlike, or to add cat-friendly features. Cattifying your space does not necessarily require spending money and buying new furniture. Cattification could simply be rearranging your shared living space to make it more welcoming for your cat. I know it might seem like your space couldn’t possibly be any more welcoming when they’ve flopped onto your face when you’re asleep at 4 AM, or when they’re trying to steal your pizza, or when their rear end is in your face when you’re trying to read a book, or… Right. You get the idea. But trust me. There’s always room for improvement. Remember that most cats want to be where their humans are. You might leave the house to go to work every day, or hang out with friends, but for most cats, their whole world is your shared living space. When they get “cabin fever,” they’ve got nowhere to go. So give them places to go that don’t require leaving the house! Consider moving furniture so that a chair or bookshelf is in front of a window. If they’re always trying to sit on one specific shelf, can you move that shelf’s contents so your cat can have premium seating? Try to find the one place in the house with the best vantage point: that allows them to see as much of the house as possible. They probably spend a lot of time there. This might be the end of a hallway, or where the dining room meets the kitchen and living room, or it might be on your dresser because they can see down the hall and keep a creepy eye on you while you sleep. Can you put a cat bed, cat condo, or a cozy chair in that spot? Always give them the box if you shop online and get deliveries! When a new package arrives, throw out the old box and let them break in the new one. Boxes that always smell new are always a source of excitement around here. 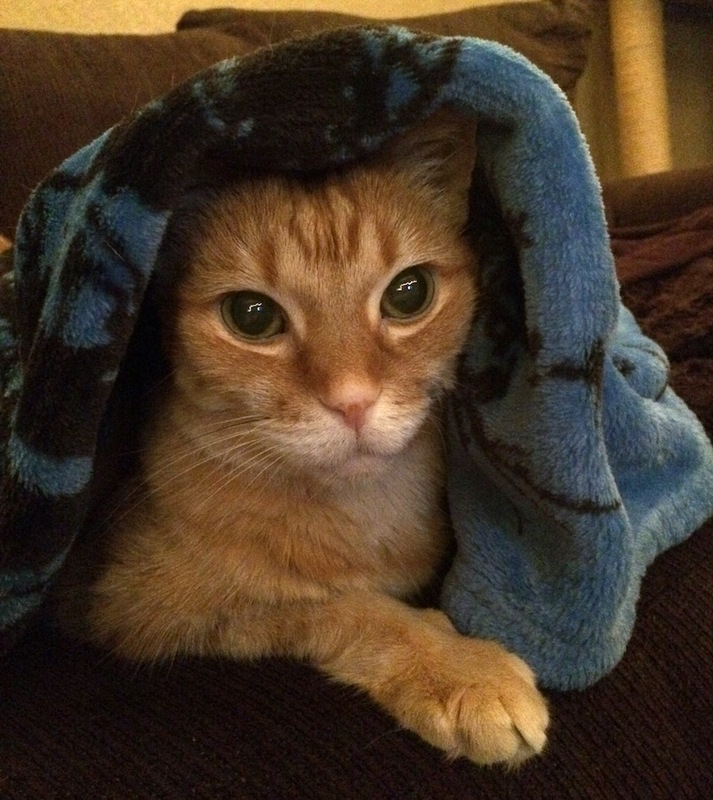 Make a (temporary) “cat fort.” Making forts with pillows and blankets is great fun for kids– and it’s fun for cats too. Hang a blanket at an angle from a closed drawer to the floor, or over the back of a chair. Turn a large box on its side and drape a blanket over the opening. Use this as the start of your playtime, and let them chase toys on sticks from behind the blankets and inside their caves. So you just got a new couch! And Ginger the tabby is just as excited as you are about it, and she can’t wait to really enjoy that new couch. With her claws. And much enthusiasm. Don’t panic! It’s okay! 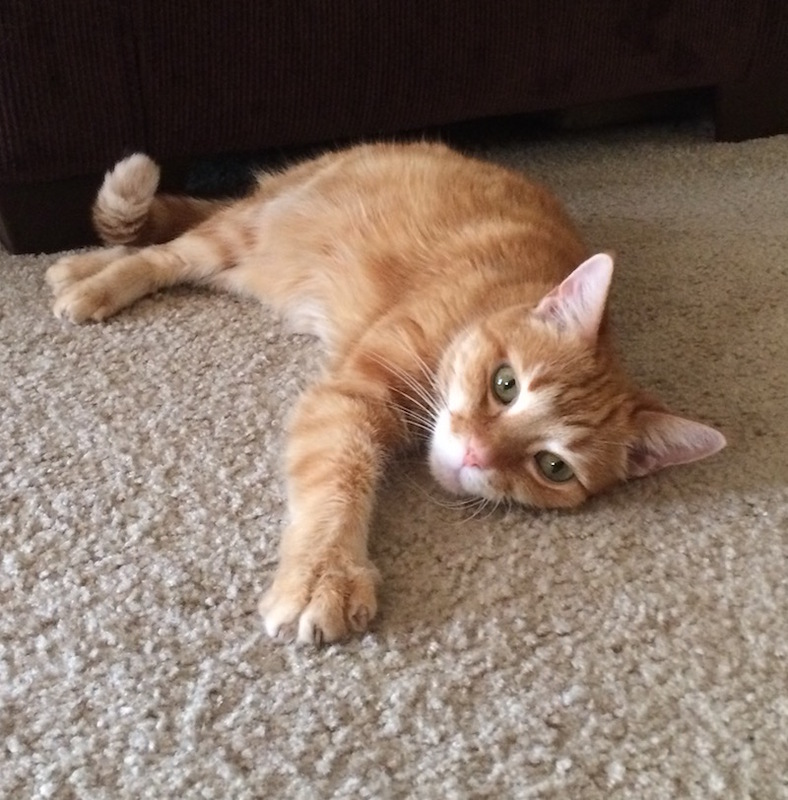 The queen of the “lazy scratch,” Ginger. First, remind yourself that scratching is natural behavior for cats. Scratching is a way to get rid of excess energy, get a great stretch, and keep claws healthy by removing the outer sheath for fresh nail growth. Plus it just feels great– you probably like a nice luxurious stretch a few times a day, too! Cats also “mark” their turf by leaving behind pheromones when they scratch. They’re claiming a space as their own, and leaving “messages” for other cats. This is a natural behavior practiced by wild and domestic felines of all species and breeds. Next, put yourself in your cat’s shoes. Or paws. They want to scratch, and you’ve got this great thing just begging to be scratched. So give them something BETTER. Move their favorite scratching post to the corner of the couch and put some catnip on it. What kind of surface does your cat prefer to scratch? Some prefer cardboard , some prefer carpet , and some prefer sisal . Remember: they’re scratching that spot because it’s a perfect spot. It probably doesn’t matter what you put there, but it’ll be all the more enticing if you give them something they really love to scratch, like sisal or a special carpet or scratching angle. Keep your cat’s claws trimmed. The blunter the claws, the less damage they can do. It’s also healthy for your cats, preventing overgrown or ingrown nails. 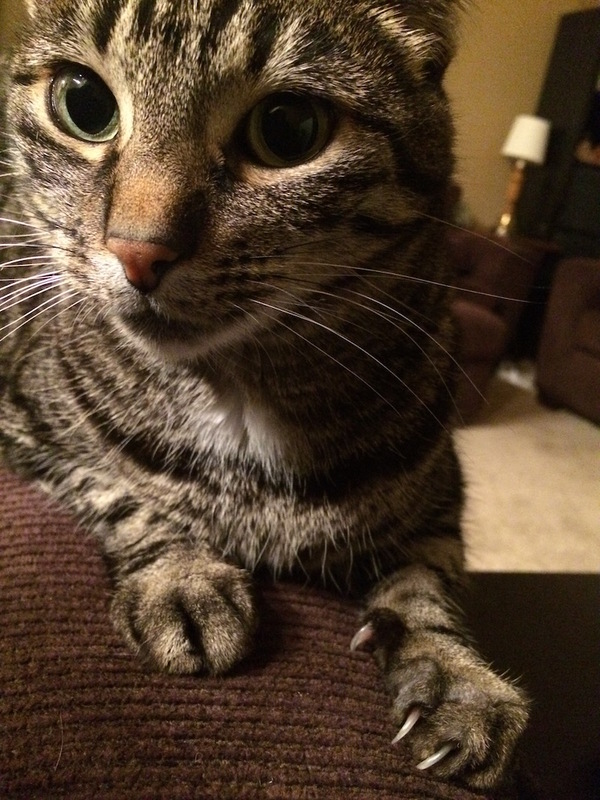 If you have trouble trimming your cats claws, get help! Groomers, veterinary technicians, cat sitters, and cat behaviorists would be thrilled to trim your cats claws and give you some tips for trying it yourself. Another product is Soft Claws , which are like tiny plastic caps for your cat’s claws. We have never tried these, but have heard from friends, clients, and cat sitters who have luck with them over the years. Sometimes you will find a particularly skilled cat groomer or cat sitter who can apply these for you, because it can be quite an ordeal to get the caps on. Once they’re on, cats can still go through the motions of scratching, without the sharp parts. Personally, we worry about the cat chewing and swallowing them, because they must feel pretty weird to wear and the feeling would encourage cats to fuss over them. However, as an absolute last resort, it might be worth a try. It’s always better to redirect rather than prevent scratching. Allow your cats a healthy outlet for that clawing energy, and you’ll both be happier! Surprisingly, other than their own cat condos, one of our cats’ favorite scratchers has always been the cheap and recyclable cardboard scratcher . And if, despite all these options, you’re still considering declawing your cats? DON’T. What kind of cat furniture should I get? If this is your first piece of cat furniture or your fiftieth, The Whisker Shop has some suggestions for deciding what to get for your feline friend. Is your cat a “tree dweller” or a “bush dweller?” Many cats have no preference at all. But if your cat has a definite preference for finding the highest point in any room, you’ve got a “tree dweller.” You’ll probably want the tallest condo you can fit in your living space, or some strategically-mounted shelves, keeping in mind that if it’s taller than their current favorite high point, you’ll probably convince them to use their new furniture much more often than your tallest shelf of priceless knickknacks. 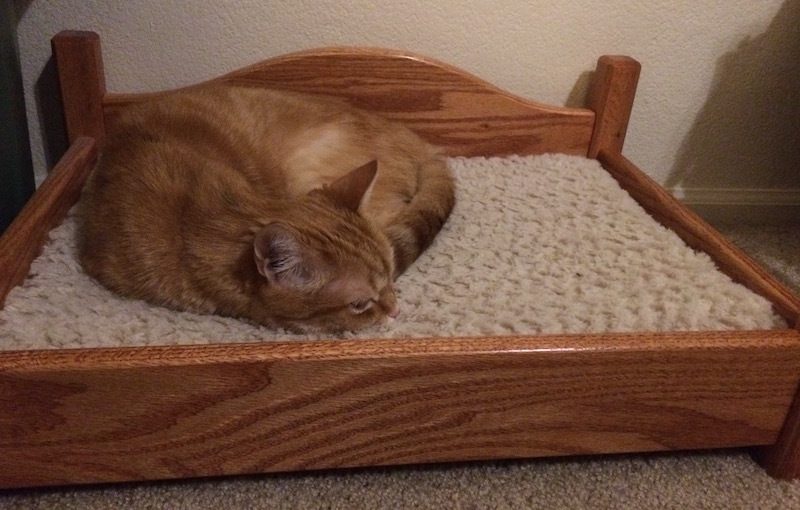 If your cat is always looking for cubbies and hidey-holes, or loves to sprawl on the floor under foot, you may have yourself a “bush dweller.” Your kitty may prefer one of our classic oak cat beds, or one of our round condos. If your cat hides often, or gets chased by dogs or children, you might consider a taller condo or shelves, where she can keep an eye on you and the shenanigans from a safe distance. How much space do you have to spare? Consider maximizing space by putting a cat bed on a dresser, putting a small condo under an unused table or desk, or mounting a scratching post to a door or wall. So you’ve picked out the perfect new cat furniture! Usually cats are quick to claim anything new as their own, often before it’s unwrapped or assembled. But what if your feline friend isn’t nearly as excited as you are, and still prefers to sit on the kitchen counter or inside that sad old cardboard box you can’t bring yourself to throw away? Here are some tricks to entice your friend to love your new furniture more than your spot on the couch. Catnip: If your cat loves catnip, rub about a tablespoon on the lower part of the condo, about shoulder height to your cat. Do the same around any platforms or inside any “hidey holes.” Then just walk away! They’ll explore in their own time. Playtime: A toy on a stick will grab their attention, and let you guide and “point” them towards the new furniture. Take care not to let your cat jump from too high of a height if your new furniture is very tall, your cats are very small, or they’re not used to climbing. This feather on a stick toy might do the trick. If your cat prefers bugs to birds, try the Neko Flies Kattipede . A quick note about cat toys with bells: sometimes cats are scared or irritated by the bells on many stick toys, and sometimes cats just love them because it’s the sound of playtime. If your cat is not a fan of noisy toys, just cut the ribbon or elastic holding the bell on, and breathe new life into rejected toys and playtime! If your cat seems timid, don’t push them. Just try again later! There’s no rush. 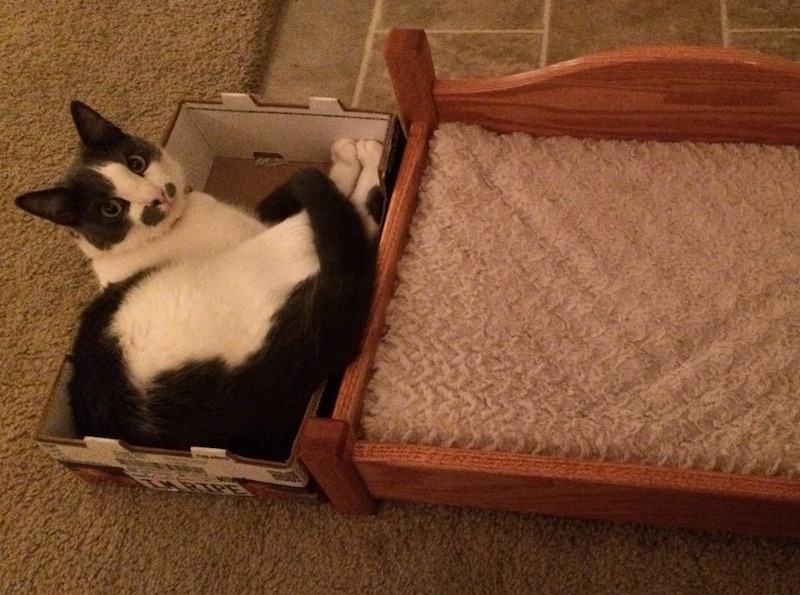 Chances are, they’ll be snoozing in their new spot soon– it just needed to be their idea, and not yours!